at the top of the South Island. We have a reputation as a fun, quirky and social campsite with a focus on the healthy outdoors lifestyle. Welcome to Paynes Ford and the Golden Bay climbing xtravaganza. Here you will find enough hard rock to wear out a Husqvarna Jackhammer. Hangdog is located in the heart of what could be called one of the most scenic, alternative and eco friendly communities in the country. Whether it’s a rainy day or you’re just feeling a little worked, Golden Bay has much to offer if you’re looking to take a break from the rock. 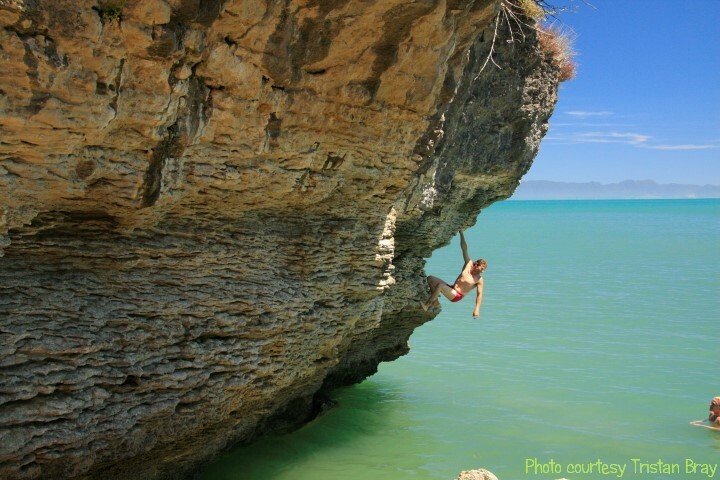 Local rock guru Mark Brignole gets his summer on with a pair of red hot pants and some fun over-water bouldering at Pohara.